Woodland Hall, GreenAcres Chiltern, Potkiln Lane, Jordans, Beaconsfield, Buckinghamshire, HP9 2XB. Teacher. 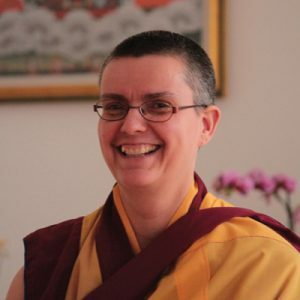 Gen Nyingpo is an English Buddhist nun with over 20 year experience of teaching meditation. Enjoy a day of peaceful silence. This one day silent retreat will enable participants to go deep in meditation and experience stillness of mind. This day will offer a wonderful and rare opportunity for you to gain a taste of silent retreat. Spending this period in silence will open the mind to the possibilities that come from external and internal quiet. Gen Nyingpo will guide each session. Each session will consist of a 15 minute talk and 2 guided meditations. Silence will be maintained during the day (apart from the teachings and guidance during sessions). Silence will begin from the start of session 1 – you can talk on arrival and ask practical questions before the session starts. Please aim to arrive at least 10 minutes before the first session so you have time to settle in. During the final session we will finish the silent period and allow time for discussion. You will also have the opportunity to ask questions. Mobile phones – please leave them silent, and please only use for emergency purposes. Stunning setting for meditation and very well organised. We really enjoyed the teaching and lots of new tools learnt. I’m looking forward to the next one! A perfect way to take time out and experience the benefits of light, relaxed and guided meditations. Set in unique and special surroundings with opportunities to explore the tranquil woodland. I’m not sure if it’s the sunshine pouring through the large windows, or feeling surrounded by peaceful woodland, or simply the warmth and practical advice from the experienced nun, but the fact is that I love these meditation retreats. What a treat! The Woodland setting is always a tranquil place, but with a gentle covering of snow and bright sunshine along with the mindful teachings and meditations, it took on a ‘magical’ feel. Thoroughly recommended. The Meditation and mindfulness retreat takes place in the Woodland Hall at GreenAcres Chiltern, near Beaconsfield. The venue is peaceful, comfortable, modern and spacious with wonderful views. During the breaks, sandwiches and light refreshments will be served and there is the opportunity to ask questions. There will be time to browse the small bookshop, relax or enjoy a peaceful walk in the lovely mature woodland. The retreat runs from 10.00am to 3.00pm enabling participants to relax and enjoy the rest of the day.